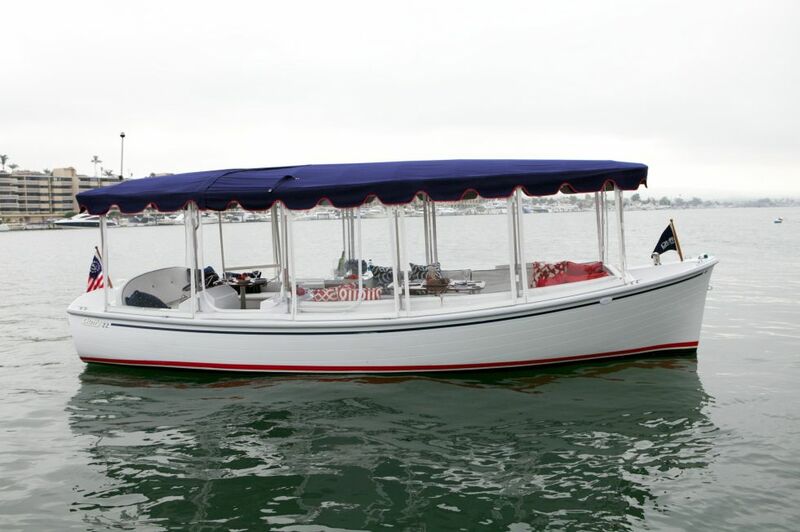 The 22 Bay Island is the flagship boat in our Duffy line up. If you are looking for maximum passenger carrying capability, and space to roam around, the this is the Duffy for you! Comfortable and cozy when it’s just the two of you, but when the family arrives with in-laws and grandkids, there’s plenty of room to go around. Extremely stable, comfortable seating, and lots of beam make this a floating living room. 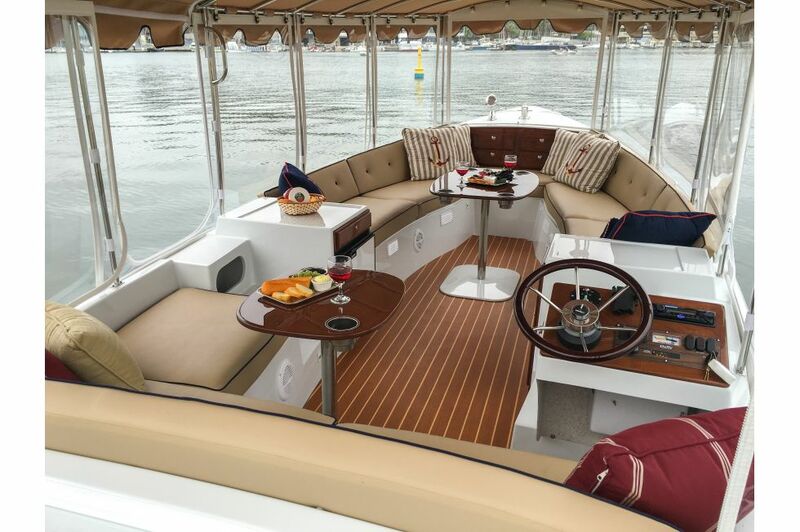 You can’t beat our flagship model when it comes to having a great time on the water with all the family and friends. 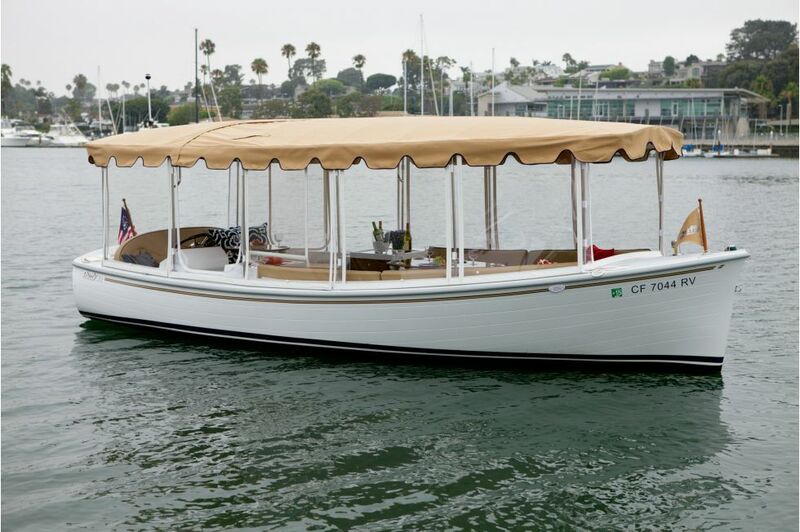 The 22 Bay Island was designed to be a foot longer, and a whopping 2 feet wider than our Classic 21′ Duffy! This gives the 22 Bay Island an unprecedented amount of interior space. 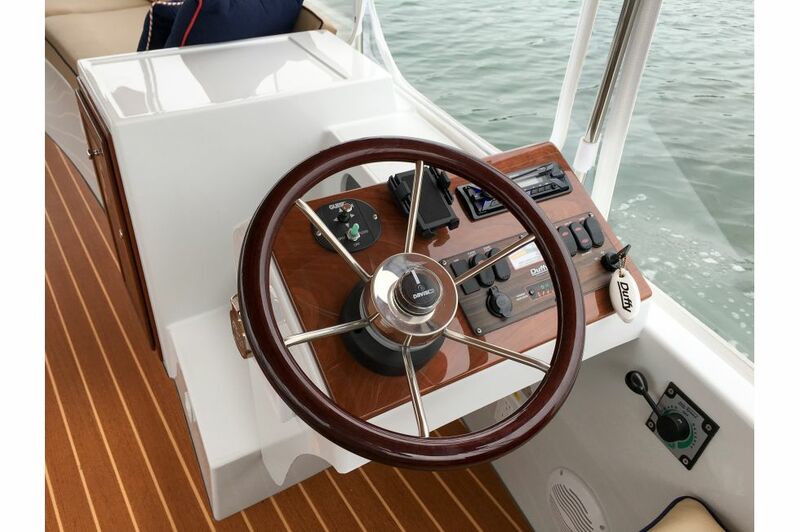 Combine the extra width of the boat, along with the unfixed movable tables and the side-steering helm, and you’ve got a completely different boat with an open interior to move about. 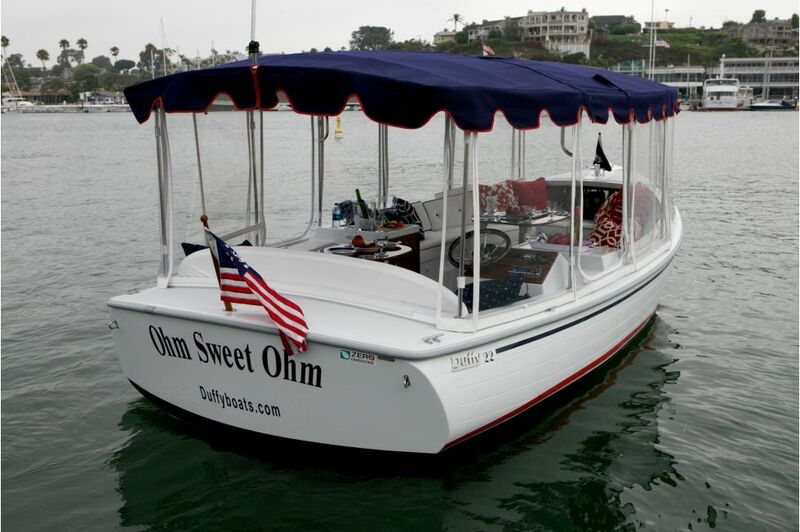 Equipped with our patented Duffy “Power Rudder” she turns on a dime and is super quiet. Another major change to come to the 22 Bay Island is the location of her batteries. Rather than being under the seats like our previous models, the batteries are now located in the keel of the boat. This provides incredible stability and tracking, along with opening up the space under the seats for more storage! 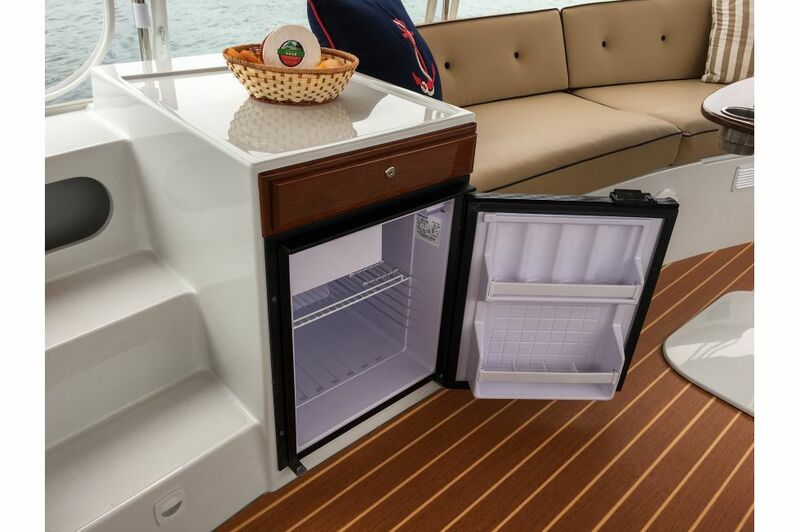 The luxurious interior offers solid wood forward and aft tables, along with a center galley which can accommodate the optional refrigerator! 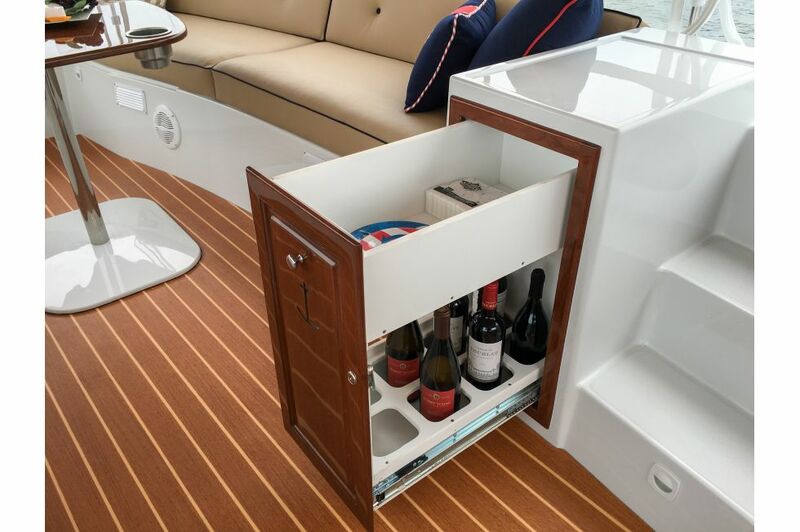 A beautiful forward bar area with wooden door, also included is the starboard side pullout and lockable wine and bottle storage locker and storage drawer! Our new “Duff Eze III” polycarbonate window system is fully UV proof, and keeps you warm and toasty on the coldest of days. 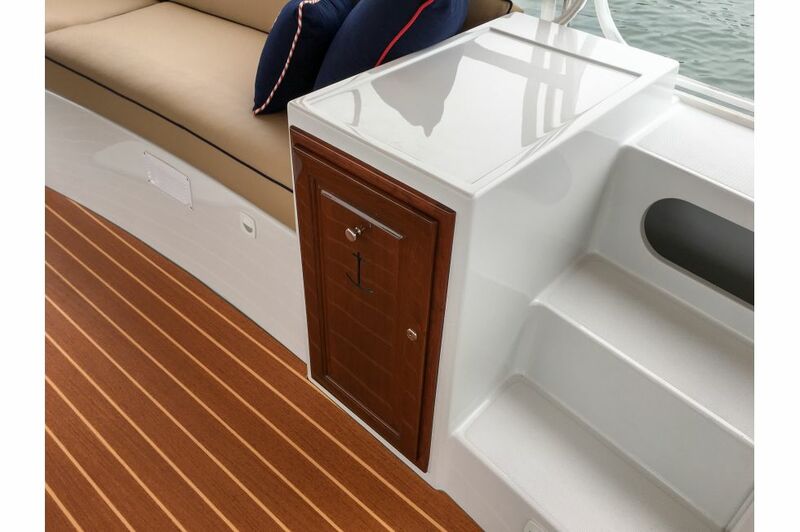 The enclosure will also keep any rain or dirt outside the boat, without the need of a full boat cover! Just unplug, untie, and unwind! 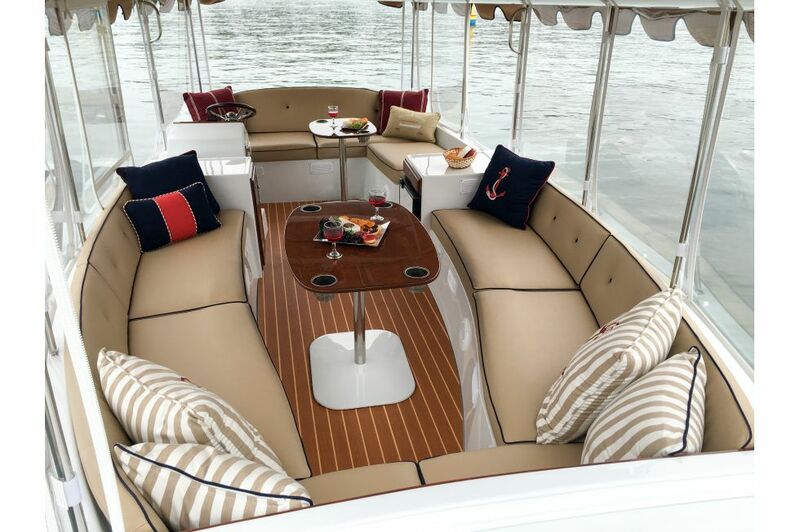 Like all Duffy models, the 22 Bay Island comes with the new Fusion Marine 50 watt per channel stereo. Play music, or take calls wirelessly with Bluetooth, or plug in for a quick charge while you play your favorite songs through the USB port! The 2017 Bay Island model includes some other exciting changes. The new Lonseal flooring gives the look of a beautiful teak floor, but without the hassle! Easy to clean and soft under foot, it will last forever. 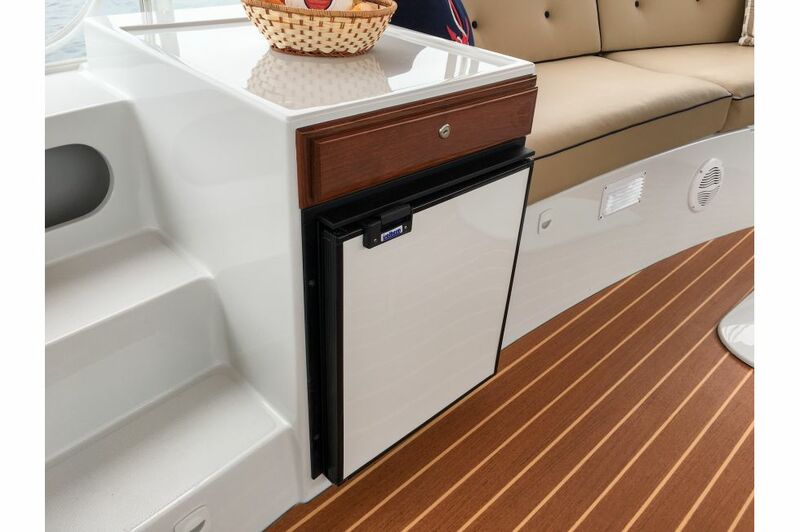 The new “Smart Plug” power connector is included on all our 2017 boats, and provides faster and more efficient charging. Navigation and interior lighting have been replaced with new efficient LED lights, which will last for years! 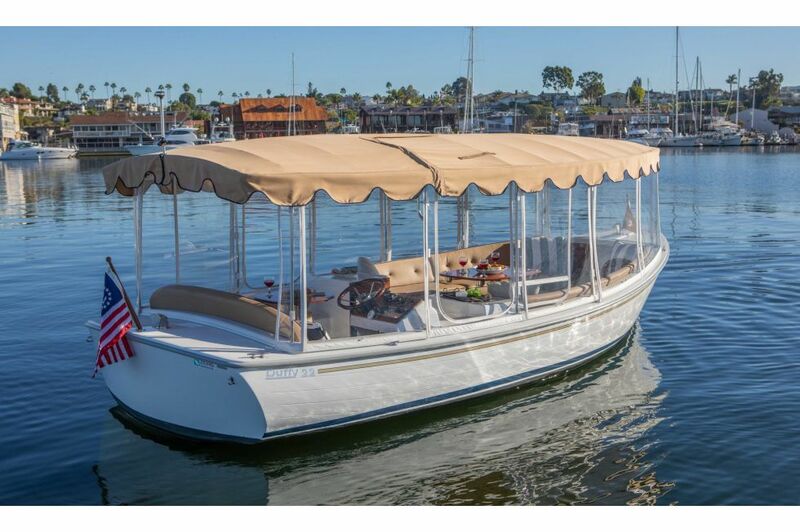 Like all of our Duffy Electric Boats, the 22′ Bay Island is made in America. The All New Duffy Bay Island 22!